There are a number of things departments can do to make their fire apparatus more functional. And, there are options and decisions that can make the units more dependable and reliable for the citizens we serve. We certainly have covered a number of these in past Rig articles, and this month I want to cover two items that are actually underneath our apparatus. With manufacturers constantly having to adjust their cab designs because of new engine releases, EPA standards, dreaded regen components, and the cab room that firefighters demand, we have to put the engine and components somewhere. A number of operational positioning decisions that we make on our firegrounds require departments to look underneath their apparatus. One of the first things we started to look at in our apparatus specifications is the clearance underneath the rig—this clearance is for all types of apparatus. Laying supply lines into incident scenes is one of the fundamental tasks that engines have to do to ensure an early and dependable water supply for incident scenes. Because of the size of streets in many response areas, the luxury of laying supply lines down the side of the street or out of the way is not feasible. This requires us to position the line right in the middle of the street. Depending on the diameter of the supply line that your department uses, this clearance can become a real issue. For companies that use five inch or four-inch supply line with Storz couplings, ensuring that all components of the chassis and engine clear these couplings is a specification demand that should be included when purchasing your next apparatus. With bigger engines and the demand for cab room, this has a tendency to push engine, radiator and other components lower in between the frame rails. You have to ensure that when taking your apparatus up or down a street and straddling a supply line that it will not get caught, hung up, or tangled on engine or chassis components. Measure the height needed twice and put it in your next rig’s specification to make sure that your hose will clear it. Another thing to consider while you are underneath a rig is the protection of critical components from damage. This protection would be from couplings striking them or from approaches. What we mean by approaches is jumping curbs to get in a preferred tactical position or angles of hills and entrances to buildings and complexes. Only you know your response area; the apparatus builder puts the rigs together based on their template. You have to inform it of any unique or special issues that will require it to beef up the protection of your rigs. 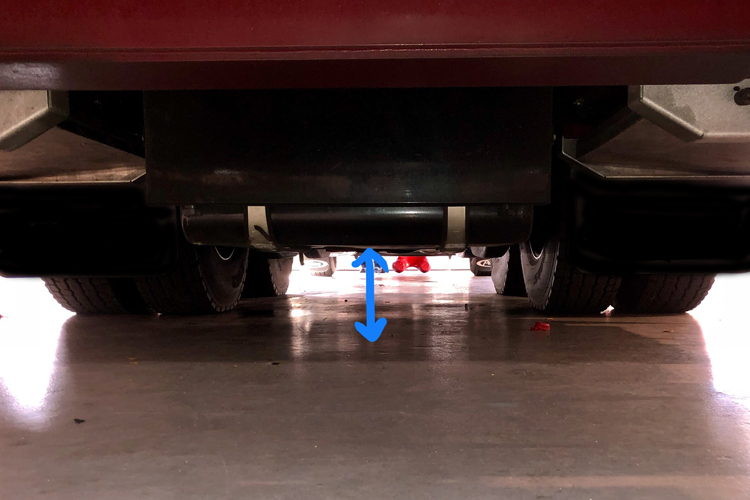 Two ways to protect underneath that we have seen help ensure that the components are protected but also give the driver/operator a warning that he is very close to bottoming out on an approach. A number of rigs at the Kentland (MD) Volunteer Fire Department make extensive use of the bumper to store initial attack lines. These trays hang below the bumper, causing some approach issues for their rigs. To assist the driver from damaging these trays, the department specified that the tow hooks on the front of the apparatus must be the lowest point of the bumper. They have accomplished this through a number of designs depending on the builder. When the driver makes his approach and it is too much of an angle, the tow hooks make contact with the road or curb and make a pretty unique noise to alert the driver that he is in danger of bottoming the rig out and possibly damaging the front trays. Another company had the builder add a thick metal square tube welded to the frame extension. The company did this because of the low mounting of the bottom of the radiator between the frame rails. This added option was great foresight by the department to protect its apparatus engine components and ensure that they are not hampered in their operational positioning. As always, it is a lot of little things that make your apparatus functional and operationally efficient on your firegrounds. Take the time to think them all through when specifying your next rig. As always, thanks for taking the time to read our Rig articles.